Need more apps for your favorite device? iOSnoops can help! Here are 41 iPhone and iPad apps that have just gone free. 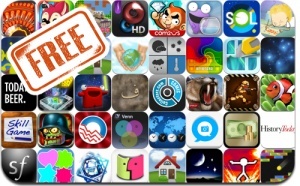 This apps gone free alert includes Tone Sphere, Carnivores: Ice Age Pro, Escape The Ape, Oldschool Blocks, Skill Game, Draw Along, Fish Paradise, AngerOfStick, Watee, Tank 90, Today’s Beer, Star Rover, and many others.